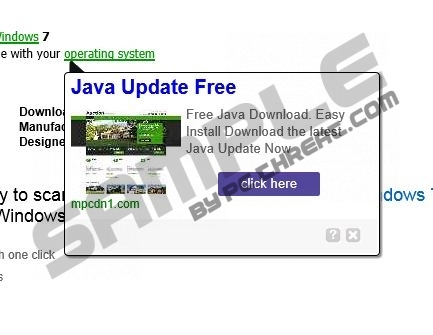 WebSpeed is yet another adware application, which’s negative features obviously outweigh the beneficial ones. WebSpeed is marketed as a useful tool that should help you determine the exact speed of your Internet connection; thus, quite a few users might be tempted to download and install this program. Unfortunately, the results provided by WebSpeed are questionable, to say the least. Furthermore, you will be constantly disturbed by adverts provided by WebSpeed. Browsing the web will become a frustrating process to put it mildly. What is even worse is that it has been discovered that WebSpeed could expose your operating system to dubious web content. Do not take any chances with WebSpeed and remove it right away, as that is the only way to keep your operating system clean and secure. The speed tests performed by this program are quite questionable as they are not all that consistent. Once this application is up and running on your operating system, you will notice that your browser is flooded with numerous third-party advertisements. Browsers such as Mozilla Firefox, Internet Explorer, and Google Chrome are affected by this dubious application. The adverts provided by WebSpeed are utterly worthless and will be displayed randomly whether you like it or not. WebSpeed must be removed in order to restore the normal functionality of your browser. Unfortunately, there is more to WebSpeed. It was noticed that some adverts provided by WebSpeed could contain redirect links. Thus, by clicking on an advert presented by WebSpeed, you could end up on a suspicious website. For instance, you could end up on a fake online store or a website that promotes fake software. Both instances are extremely dangerous. It should be obvious to any security-conscious user that removal of WebSpeed is essential, as it is an application that could be the cause of significant damage inflicted on your operating system. If you wish to avoid infecting your PC with applications like WebSpeed, we strongly advise you to implement a reliable malware detection and removal tool that will provide overall security at all times. Furthermore, a reliable antimalware tool would certainly ease any removal process, if it is necessary. Also, practicing safe browsing habits would decrease the risk of getting infected with some dubious Internet-based infections. The removal instructions of WebSpeed are provided below and should be executed immediately if WebSpeed is running on your PC. Remember to pay extra attention to the removal process, as just one mistake could mean that the infection was not removed entirely. In order to make sure that WebSpeed was deleted completely, we firmly advise you to scan your system with a professional antimalware program after conducting manual removal. Select All apps and click Control Panel. Confirm that you want to remove WebSpeed. Type Control Panel into the text box and click OK. Select WebSpeed and click Uninstall. Right-click WebSpeed and select Remove. Quick & tested solution for WebSpeed removal.